Every now and then, I happen upon a restaurant that I like so much it makes me giddy to share with City Weekly readers. Del Mar al Lago is one of them. Quite simply, this is the best Salt Lake City restaurant you’ve probably never been to. If you haven’t eaten there, you should stop reading. Now. Get in the car and go. It’s that good. Although I can’t really take credit for discovering it. It was enthusiastically recommended to me by one of Utah’s most talented and creative chefs, a guy who lived for a number of years in Peru. I had to sit on reviewing this restaurant for a while; just as I was about to do so, they closed for an expansion. So, this review is based on the pre-expansion Del Mar al Lago. Since my visits, they’ve added a cebiche counter, increased the size of the restaurant and added a full bar with wine, beer and liquor. You can now get an authentic Pisco sour at this Peruvian gem. Frankly, my attitude toward Peruvian cooking used to be meh—too many potatoes and bland flavors. Well, I’ve had an attitude adjustment, thanks to Del Mar al Lago. As was explained to me at the restaurant by a very knowledgeable server named Guillermo, Peruvian cuisine is really a combination of three regional cuisines: highland, midland and coastal. And it’s a fusion of flavors, with influences ranging from the Incas, the Moors, Spaniards and their African slaves, to France, China and Japan. It’s truly melting-pot cuisine. 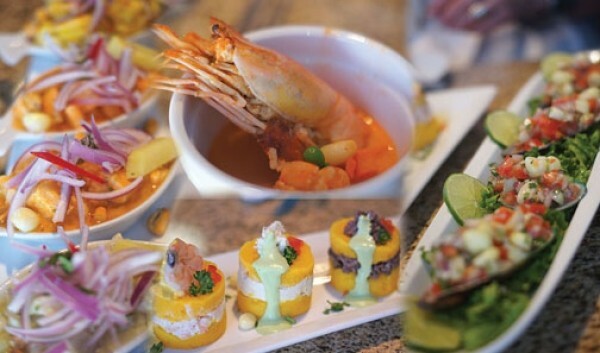 At Del Mar al Lago, there’s a wide range of Peruvian flavors represented, from cebiche (aka ceviche)—Peru’s gift to seafood lovers worldwide—to classic dishes like lomo saltado, causas, tacu tacu, sopas and much more. The menu is extensive. It’s also very reasonably priced. You can eat until you can’t move, on the cheap. Portions are large, and I recommend sharing with friends, as we did on our visits. I was lucky to share meals at Del Mar al Lago with a couple of well-known chefs, both of whom were as impressed by the food, service and presentations as I was. I recommend starting with cebiche. The great Chef Eric Ripert says, “Cebiche requires perfect quality ingredients, very precise and fast execution, as well as a perfect understanding of the spices and acidity.” Well, I can’t imagine cebiche any more perfect than at Del Mar al Lago. The fish used there—including 100 percent sustainable Alaskan halibut or grouper—is incredibly fresh and of the highest quality. The cebiche tasting ($17) is a fine way to sample of range of cebiche preparations and accompanying sauces. It’s four different cebiche dishes, made with the fish of the day, halibut, scallops, calamari, shrimp and grouper, depending on what’s freshest. The raw fish is “cooked” on the way from the kitchen to the table in a citrus bath of lime and lemon, and served with various sauces like aji amarillo, rocoto, salsa cruda, salsa Criolla and others. It’s an acquired taste, but you may be offered leche de tigre (tiger’s milk), which is the milky and citrusy juices and spices leftover from cebiche, poured into a glass and drunk straight; it’s supposed to be a great hangover cure. I prefer chicha morada ($2), a sweet drink made from Peruvian purple corn with hints of pineapple, cinnamon and clove. Next up: Try the causa tasting ($9). At Del Mar al Lago, the causas are cylindrical terrines of whipped Peruvian yellow potatoes with a layer of minced seafood in the middle. The tasting we tried was four causas: one with octopus and an olive sauce, another with albacore tuna and a zippy aji amarillo made with Peruvian amarillo peppers, and two causas camarón—sweet and spicy poached shrimp and onions with rocoto and leche de tigre. The rocoto is a spicy mayonnaise made with fiery rocoto peppers. My favorite is the albacore tuna, if only because it gives me an excuse to enjoy the highly addictive aji amarillo. I love that stuff! The soups and stews are also excellent. We enjoyed a fantastic chupe de camarones ($15), which was a huge bowl of rich, bright orange-colored broth brimming with both shelled and heads-on prawns, and accompanied with white rice. Again, it’s another very sharable dish at Del Mar al Lago. Lomo saltado ($13) is common in Peruvian restaurants, a dish with Chinese influences. It’s strips of beef marinated in soy sauce, vinegar and Peruvian spices, then stir-fried with onions and tomatoes and served with steamed rice. Del Mar al Lago does a very respectable version of lomo saltado, although I must admit I don’t find it one of the more tantalizing examples of Peruvian cuisine. Tacu tacu, too, is classically Peruvian—an Afro-Latin mélange of stewed beans, red onions and meat or seafood, served with rice and salsa criolla. I tried the lomo saltado tacu tacu ($12) and enjoyed the flavors, although the serving temperature was a tad tepid. Gosh, there’s so much more, like chaufa de mariscos ($14), which is a big plate of Chinese-style fried rice with seafood and a humungous blanket of scrambled egg on top. Or tiradito, which is a Peruvian fish dish similar to Japanese sashimi: raw fish in a spicy sauce, differing from cebiche in the manner in which the fish is cut (thin slices vs. chunks) and served without onion. There are eight different tiraditos on the menu, but the tiradito de lenguado en crema de aji amarillo ($16) is out of this world! It’s thin, nearly translucent slices of fresh sole (lenguado), topped with aji amarillo and Key lime juice and accompanied by canchita (the “unpopped” popcorn of Peru) and Peruvian corn. Daily dinner and lunch specials at Del Mar al Lago are priced ridiculously low at $8.50, and include salad or soup and a soft drink. Go. Eat. Drink. Be happy. Tell your friends.